The striking two-tone color combinations and the smooth, rounded stylized shapes of these duo, or two-in-one, designer wedding rings – each consisting of two separate bands hand forged in each other – in combination with the diamond in the ladies' ring are reminiscent of the daily interactions in nature between the earth and the sun and the celestial bodies in the night sky. The design of the ladies' ring, a red gold band that I hammered around a smaller yellow gold band, refers to mother earth revolving around the sun; it’s not hard to imagine, then, that the yellow gold band in the men’s ring represents the sun…revolving around mother earth. A more fitting metaphor for the love between two life partners and the protection they receive from each other is hard to imagine. The sparkling diamond in the ladies’ ring reflects the fire of the stars in the night sky, symbol of the eternal love burning between the two life partners. 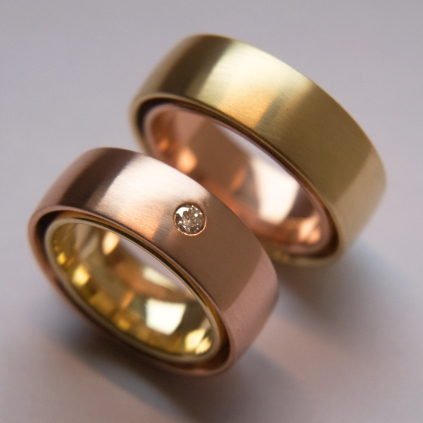 The insides of both wedding rings come with a heavy domed comfort fit.